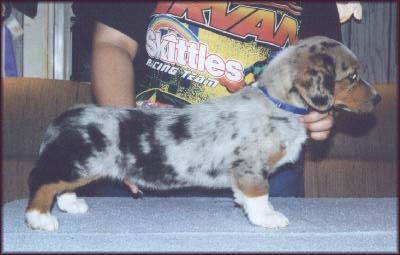 One of Bolt's first two sons, Blast was a handsome, clear blue merle with tan points. He had a fantastic shoulder, very good front and his sire's excellent bone, body length and correct oval chest. He had a handsome headpiece, flashy markings and a great attitude in the show ring that caught the attention of many during his limited show career. He finished his UKC Champion title quickly. 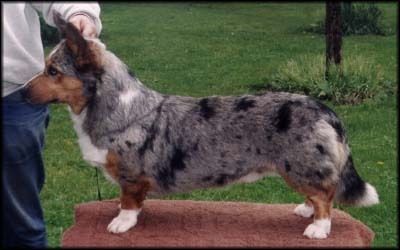 He also recieved a Group 2 placement at an AKC Sanctioned puppy match and was awarded some points as an adult in limited showing, but was never titled in AKC. Blast also spent some time living at ST's kennels where he sired two litters before coming home to retire at Wyntr. Sad;y, Blast suffered an adverse reaction to some medication he was being given to treat the arthritis he had begun to develop by age 13. 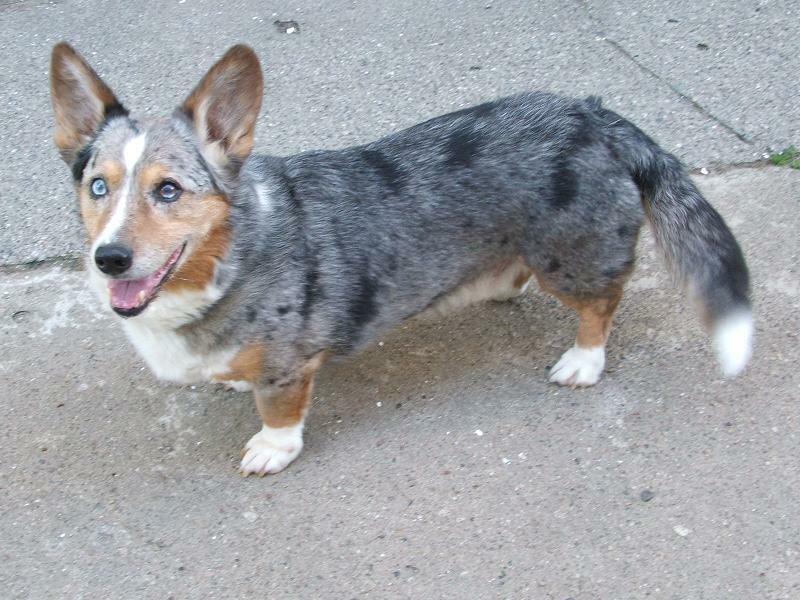 Unfortunately he went into critical organ failure, particularly in his liver and on August 3, 2013 we said a very sad good-bye to this wonderful boy. Blast, age 13. On his birthday, June 2013. 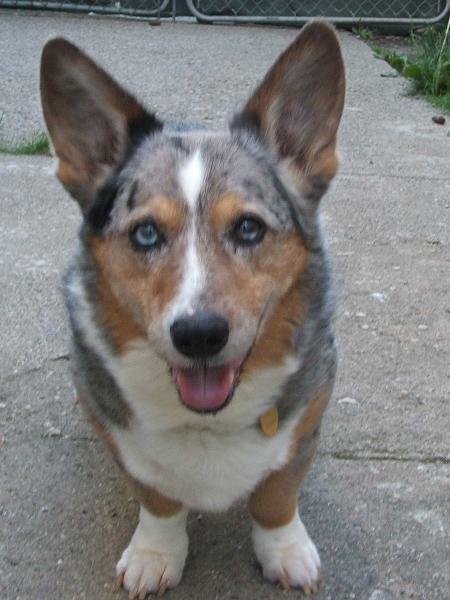 Blast was the household clown and had a wonderful, loving personality that shone through, even in his final days. He was one of the smartest Cardigans I've had the pleasure to share my life with and knew how to open cupboards, drawers and even doors if he had a mind for it. 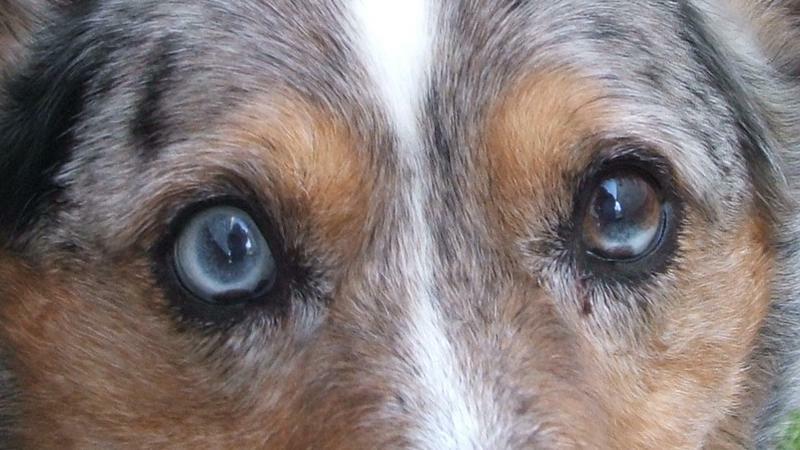 He rarely missed an opportunity when food was involved and was a pleasure to work with in obedience. He never gained any performance titles, but easily earned one leg toward an RN while being handled on a whim by a friend, without any previous introduction to the obstacles. In conformation his 'going away' was not ideal, so he only earned a few points in the AKC ring in limited showing. His last win at 10 years old was WD at the Detroit Cobo Hall dogshow, only as an entry to provide an excuse to attend the show. 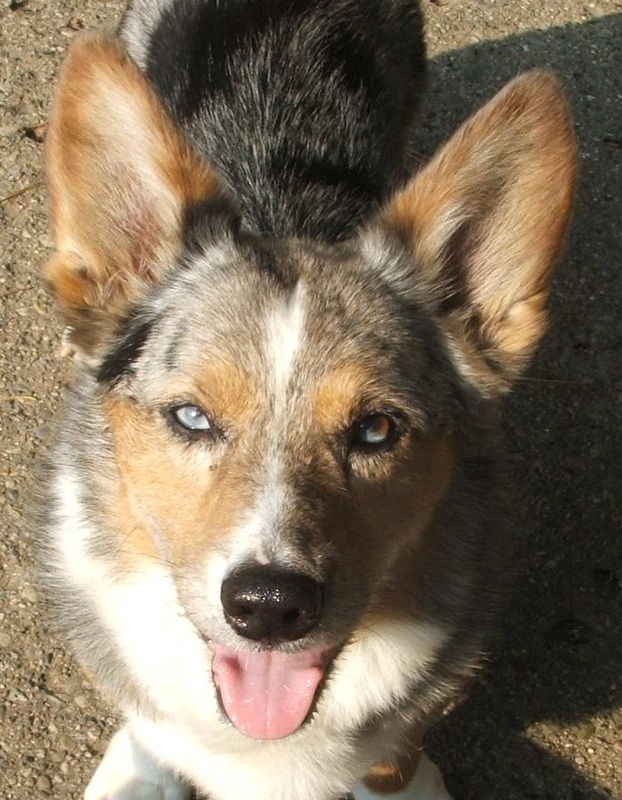 Blast is survived by his half-sibling, Quick, his daughters Tiera and Trekkie, his son Starter, grandkids, Remy, Vash, Eres, Malibu, Elsa and Ember from the Wyntr "E" litter and Trekkie's kids born at Fairlane, Alvin, Trudy, Murphy, Pepper, Matilda, Odin, Bonnie and Erie who are beloved pets living with wonderful families.. Other members of the family include his cousin and arch rival Bastion, Bastions' sister Beautiful. Her kids Cowboy and Celeste and Celeste's daughter Dyna. 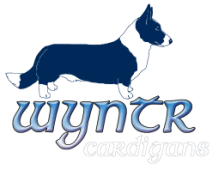 Many thanks again go to Lynn Griner of Peach Cardigans for trusting a newbie at that time when she bred Blast's mom Emmie to Wyntr's foundation dog Bolt to produce Blast and his brother, Ollie. Thanks also go to Bill & Nancy Buckland (NaB's) and Charlie MacInnes (Finnshavn) for the wonderful qualities passed down to Blast from their lines behind Emmie and to Kim Shira again for producing Blast's sire to help found Wyntr kennel and to all the other breeders who's efforts have been a contribution to this pedigree. Run free from pain now Blast and may the love and joyful, mischievous light that shone in your eyes continue to shine in your kids and grandkids. You are not gone, just gone on ahead.